site for games, concerts and other community events. The Potomac Nationals plan to head to Fredericksburg, a move that backers expect will bring more than minor-league baseball to the city. 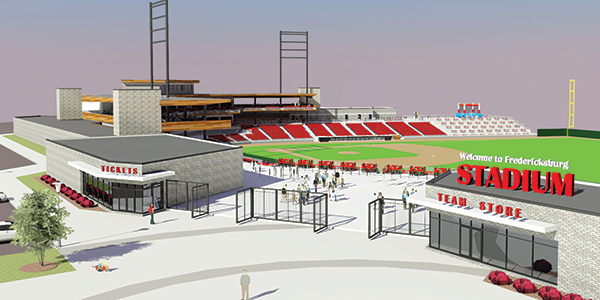 A key component of the plan for a 5,000-seat, $35 million baseball stadium in Fredericksburg is its intended multipurpose use, says Bill Freehling, the city’s director of economic development and tourism. The Fredericksburg City Council voted 7-0 in July to approve a preliminary agreement with the Potomac Nationals, a Class A affiliate of the Washington Nationals, to relocate the team. A letter of intent between the city and the club set in motion a four-month study period with the target date for opening the Fredericksburg stadium set for spring 2020. The P-Nats have played in Pfitzner Stadium in Woodbridge since 1984. The new stadium would be privately financed, maintained and operated by the baseball club, but the city would pay $1.05 million annually to the club for 30 years, the minimum amount of time that the club would be required to remain in Fredericksburg. The city’s payment would come from revenue generated by the stadium. He adds, “This is our second time through for baseball.” Five years ago the city held talks with another Washington Nationals farm team, the Hagerstown Suns, but the Suns stayed in Maryland. Freehling and Kelly tout the Fredericksburg location, about halfway between Washington, D.C., and Richmond, just off Interstate 95. “We would get more exposure in the D.C. market, which is a target market for us,” Kelly says. Freehling notes that the stadium location, known as Celebrate Virginia South, already has an expo center and three hotels. Does the move mean a name change for the team? “Nationals is a strong brand, but we have had conversations about having a contest to name the team,” Freehling says.